A new study calculates that the island of Borneo lost nearly 150,000 orangutans in the period between 1999 and 2015, largely as a result of deforestation and killing. There were an estimated 104,700 of the critically endangered apes left as of 2012. The study also warns that another 45,000 orangutans are doomed by 2050 under the business-as-usual scenario, where forests are cleared for logging, palm oil, mining and pulpwood leases. Orangutans are also disappearing from intact forests, most likely being killed, the researchers say. The researchers have called for more effective partnerships between governments, industries and local communities to ensure the Bornean orangutan’s survival. Public education and awareness will also be key. JAKARTA — The world lost nearly 150,000 orangutans from the island of Borneo in the past 16 years due to habitat loss and killing, and is on track to lose another 45,000 by 2050, according to a new paper in the journal Current Biology. The data also suggested that only 38 of the 64 identified spatially separated groups of orangutans, known as metapopulations, now include more than 100 individuals, which is the accepted lower limit to be considered viable. “They are disappearing even faster than researchers had envisaged,” said Maria Voigt, a researcher at the Max Planck Institute for Evolutionary Anthropology in Germany and lead author of the new study. “The major causes are habitat degradation and loss in response to local to global demand for natural resources, including timber and agricultural products, but very likely also direct killing,” Voigt wrote. 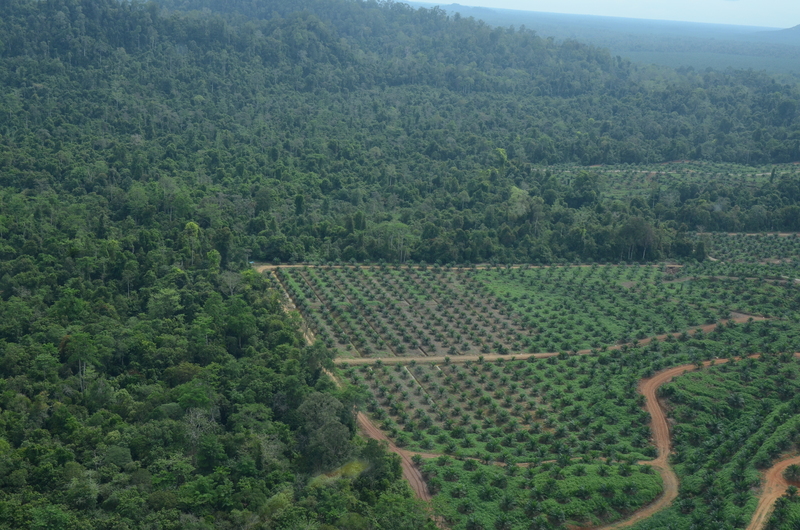 Forest and oil palm plantation in Borneo. Photo courtesy of Dr. Marc Ancrenaz. Some 288,500 orangutans were believed to live in Borneo in 1973, when three-quarters of the island was still covered with forest. By 2012, the number had dropped to an estimated 104,700 individuals, according to the IUCN. Within that nearly four-decade span, more than a third of Borneo's rainforests was destroyed due to fire, logging, mining and the proliferation of plantations, particularly oil palms. The scale of the deforestation had a severe impact on the population of the island’s orangutans, the largest arboreal animal. “The decline in population density was most severe in areas that were deforested or transformed for industrial agriculture, as orangutans struggle to live outside forest areas,” Voigt said. The study found rates of orangutan decline were highest — 63 to 75 percent — in areas deforested or converted to plantations in both Kalimantan, the Indonesian portion of the island, and the Malaysian state of Sabah. Conversely, there were almost no industrial plantations and deforested areas within the orangutan metapopulation range in Sarawak. “Worryingly, however, the largest number of orangutans were lost from areas that remained forested during the study period,” Voigt said. The loss of orangutans in untouched, or “primary,” and selectively logged forests, where the majority of orangutans occur, accounted for 67 percent of the total estimated loss in Borneo between 1999 and 2015. Voigt suggested “a large role of killing” as the main cause for the population decline in these areas, particularly in the absence of plausible alternative explanations, such as infectious diseases of the type observed among African apes. Last August, the Indonesian government reported that four-fifths of 57,350 wild orangutans in Kalimantan lived outside national parks and other protected areas, leaving them exposed to poaching and conflicts with humans. But some of these killings are also intertwined with deforestation and logging, Voigt noted. “People on Borneo kill orangutans out of conflict-situations, when the animals are pushed into entering gardens or plantations because their habitat has been destroyed,” she said. “With the increasing development and the resulting deforestation and conversion the interface between wildlife and humans increases, the number of the humans increases and the habitat that is left for orangutan decreases,” she added. Voigt said the study provided only a small snapshot of orangutan-human interactions on Borneo. Female Bornean orangutan with offspring. Photo courtesy of Dr. Marc Ancrenaz. Voigt’s study projects a further loss of at least 45,300 orangutans by 2050, based solely on the direct consequence of habitat loss. If current deforestation rates hold, some 215,000 square kilometers (83,000 square miles) of forest in Borneo will have been lost between 2007 and 2020, reducing the remaining forest cover to 24 percent, according to a 2012 study by the WWF. 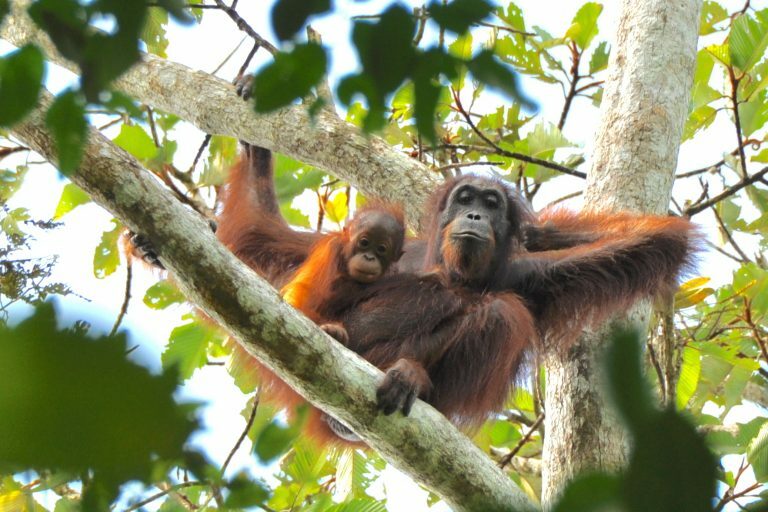 Voigt said her team’s findings highlighted the need for a shift in efforts to protect orangutans in Borneo, including habitat conservation and measures to combat the illegal killing. “This is something that our report could confirm. That even if there is forest, the orangutans are disappearing and more conservation measures are necessary, such as awareness raising, education, support in conflict situations for local communities, law enforcement,” she said. The Roundtable on Sustainable Palm Oil (RSPO) and the Forest Stewardship Council (FSC) are examples of certification schemes that incentivize these partnerships, by enabling consumers to favor responsible natural resource management. The Indonesian government in 2016 declared a five-year moratorium on new licenses to establish oil palm plantations across the archipelago. The policy also included revoking forest release permits for the period 2015-2016.